We appreciate your selection of our office. To serve your orthodontic needs, we will do all we can to provide you with the very best of care. We thank you for the trust you have placed in us. Dr. Reiss and his professional staff will make every attempt to honor that trust by being committed to excellence and quality care in a comfortable and relaxed atmosphere. We will be more than happy to answer any questions you might have concerning our office policies and services. This examination will include a detailed medical history and a thorough orthodontic examination, the taking of all necessary x-rays, study models (teeth molds), and photographs of your mouth and face will also be done. These are called diagnostic records and they will allow Dr. Reiss to thoroughly develop a treatment plan for your specific case. All patients are encouraged to call with any questions they might have concerning orthodontic needs. Our office staff is well qualified to answer most questions. In many cases, they will be able to answer your questions directly or relay answers to you. If the call requires Dr. Reiss to speak with you, he will return your call at his earliest opportunity. 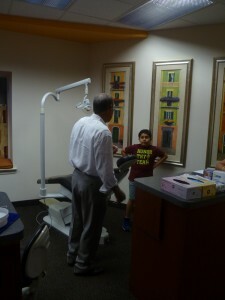 Both Dr. Reiss (Orthodontist) and Dr. Horchos (Pediatric Dentist) participate with many insurance plans.